Systems Science and its Disciplines. 2. Systems in Water Resource Management. 3. Mathematical Methods Used in Systems Theory. 4. Application of Computers in WRS. 5. Models of Optimal Programming. 6. Simulation Models of Water Resource Systems. 7. Inventory Models. 8. Queuing Theory Models. 9. Graph and Network Theory. 10. 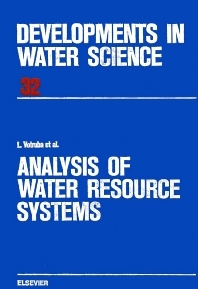 Other Methods of Water Resource Systems Analysis and Synthesis. 11. Information and Information Systems in Water Management. 12. Water Resource Systems Projects. 13. Prospects of Water Resource Systems Analysis and Synthesis. References and Bibliography. Index. Water resource systems research provides a basis for rational water management in large basins. The design and operation of water resource systems are both the most complicated and the most important tasks of water management. This book deals with the basic issues involved in the application of systems sciences to water management. A survey of the systems sciences (the general systems theory, cybernetics, systems engineering, operations research and systems analysis) is presented, as well as the methods for water resource systems analysis and for water resource systems analysis and for their evaluation. The mathematical methods used in systems theory have been given detailed treatment. Linear and dynamic programming have been used as models of optimal programming. Since many practical tasks require the simulation models of water resource systems, apart from their principles and a detailed description, the simulation language for computing programming has been included. Other methods of operations research and their application to water resource systems have been analysed and evaluated. Some of these are: models of inventory theory, models of queuing theory, graphs, network analysis, and some special methods like the out-of-kilter algorithm, the chance-constrained model and the chance-constrained model combined with the simluation model. One chapter is devoted to information and information systems in water management. The final part of the book deals with prospects for water resource systems development. The book is intended for engineers and decision-makers involved in projects, operation and research. However, it can be used by students in high schools, technical universities and by graduate students. It will serve as an up-to-date source of information about the principles and methodology of water resource analysis and design.